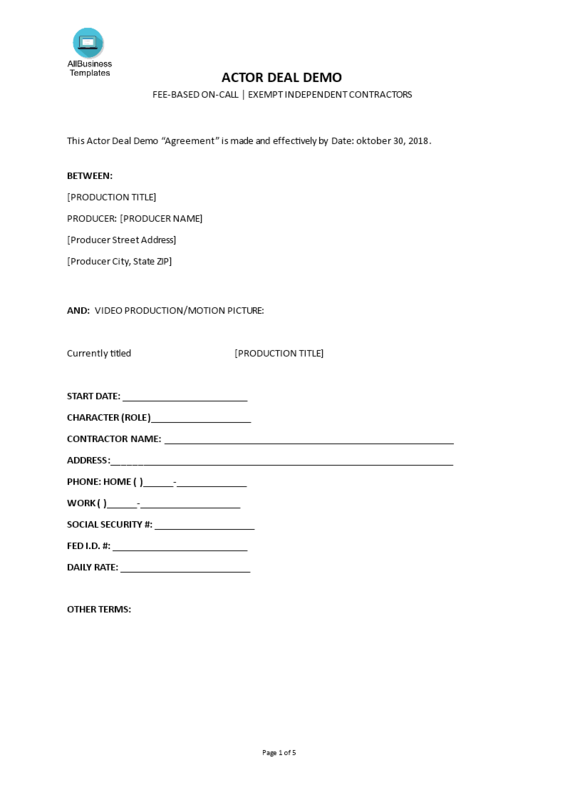 This ready-made Film cast deal memo template is well suited for any kind of personalized business matter. Communicating in a professional way will get you and your company respect and will make you more successful. It's good to make a deal demo if you want to involve parties in making a demo or movie. It is similar to an agreement. This is a very common way in the entertainment industry. It is a form of negotiations of the cast and people involved in making a particular project or show. Making a deal memo requires you to have a background knowledge on what to state. Check out this example film cast demo, or search for other samples to choose from for free. This Actor Deal Demo Template is easy to modify and some changes can be done, including the content, and according to your needs and preferences. You will have saved time that you can use to focus on other matters that are important. However, this document is really suitable to use, don’t assume that this document is perfectly correct and appropriate for your production. Have an entertainment attorney review any production agreements you plan to make. For sure check it out and download this Actor Deal Demo Template now and save yourself precious time, cost and efforts in order to become more successful!